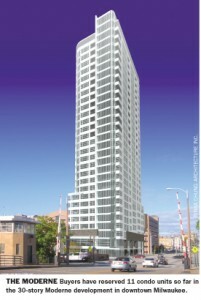 The Moderne, if approved, would be located at 1141 N. Old World Third St. The high-rise project would include 203 rental units, 14 condominiums, 214 parking spots, and a retail component. The plan included expanding the Park East TID by $11 million to provide for $9.3 million in loans for the Moderne, $650,000 for the construction of a new park, and $850,000 for administrative costs. The majority of funding for the project, a $41.4 million loan, would be serviced through Capmark Financial Group, funded with AFL-CIO pension funds, and guaranteed by HUD. Alderman Michael Murphy pointed out that with a 221(d)4 HUD loan, “you can’t go to a private bank anyway, you have to go to a municipality.” The discussion revolved around the risk taken on by the City of Milwaukee if the 14 condos were not sell over the course of four years. It came out during the meeting that Phase II of The North End project would likely be seeking some sort of city assistance as well, and that the city believed the three projects, The Moderne, the Bookends, and Phase II of the North End could receive city assistance as multiple market studies indicated a demand of approximately 600 of these type of units in the near downtown area. The Committee generally indicated that the primary issues revolved around the better defining of the default clause, securing the developer’s personal guarantee, and improving the RPP numbers. The project was held until by the Committee, until a special meeting immediately prior to the November 3rd Common Council meeting, with the intention that these three main issues could be resolved, and the project could possibly receive approval. I am always a big proponent of more high rises in the downtown area, if only to make the city look as big as the population suggests. If this project will also revitalize the Park East area (which absolutely needs it) as well as brings more people downtown, there is no reason to deny it. Looks like a nice addition. Glad to see that the project is mixed-use, mixed-income, and dense—three important characteristics for quality urbanism! Its hard to tell from the rendering, but looks like the building will be well designed at the street-level too. @Spencer I’d guess the income is generally at the upper ends, so not terribly mixed, but the building itself is very well designed. If this goes through, they should rename it “The Internationale.” It’s about as “Moderne” as Russia in 1917. If the “private” developer is coming hat in hand to the City as keep of the public trough and the AFL/CIO (well maybe they came hat in hand to the developer) then this is about as absurd as our shares in GM. If the City wants to roll the dice with other people’s money, some jobs should be added to the pot, starting with the DCD commissioner’s. The decision ought to be made on the basis of a rational risk assessment, not out of a desperate need to kickstart the Park East. @Socialisme! Love the handle… Anyhow it appears to me they are looking at the risk vs reward of the project.